The most important ingredient in any relationship, business or personal, is trust. If you value your personal savings and do not normally throw thousands of dollars away on events that may or may not happen in the future you should look a bit harder at the real estate industry and how most real estate agents operate. Unfortunately, one of the worst things you can give to a Real Estate Agent is your trust. The real estate industry is notorious for not being trustworthy. Opinion polls have demonstrated public sentiment towards real estate agents for years as being the least likely people to place your trust in (for the year 2015 it sits at a 9%). There are too many poorly trained and unskilled agents operating within the real estate industry. They are protected by the sales agency agreement documents you sign (without properly reading) at the point where it says … Vendor Indemnifies the agent. Before you choose your real estate agent you must qualify them. Ask many questions, check references, insist on receiving their genuine past sales performance history both in properties sold and initial asking price to selling price accuracy. This is how you will find out just how good the real estate agent really is. Do not fall for a fake. If your real estate agent refuses to do this reject them. After all this is your property, your money, your biggest financial asset. You only get one chance generally in real estate to get a great price, do not sacrifice this through selecting an unqualified and under performing agent. Above all, insist they sign the Home Sellers Protection Guarantee document (irrespective of whether you trust the agent or not). There is no reason why they shouldn’t. It should be a minimum standard of the real estate industry enforced by the government … but it isn’t. Remember the saying “Buyer Beware”. You are a buyer when it comes to selecting a real estate agent. You are “buying” the services of a real estate agent. Make certain that whoever you chose signs a document guaranteeing their performance … it would be a financial risk (for you) not to do so. Many real estate agents will make excuses as to why they can’t but you must not give in if you value your hard earned savings and the future potential selling price of your property. If you sign their paperwork and they do not sign your guarantee document, you are at risk with no written evidence to rely upon later on if the worst case outcome should happen … as it does for many people. Your only avenue of recourse is civil court and that will cost you tens of thousands of dollars to engage in, and even then the “standard agency agreement” paperwork you signed will work against your claim. 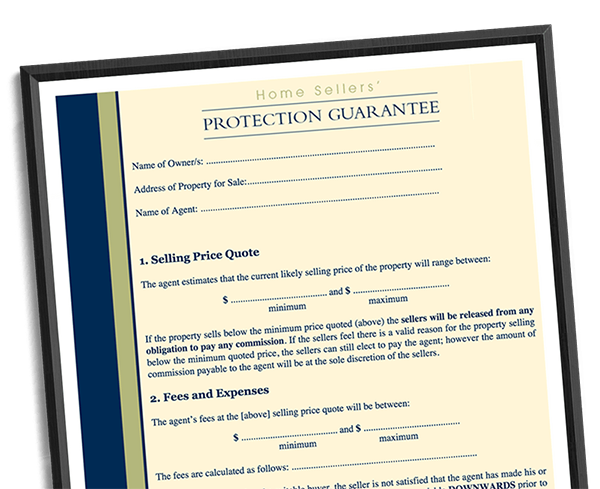 A real estate agent who will not sign the Home Seller Protection guarantee is a real estate agent you should avoid. And finally, ask yourself: Do I feel comfortable with this person handling the sale of my family home?